When working with WordPress, one of the most impressive and humbling things is the people. Specifically, it’s how WordPress helps one another. That is, the WordPress community. Not sentient software. Please. We’re at least four years away from that. There are generous people among us. To be clear, this post is not about my asking for help with raising money for a project or a venture. Instead, it’s about helping to raise money for a fellow developer’s significant medical cost. If you’re on Twitter or if you’ve used NextGEN Gallery, you’re likely familiar with @JellyBeen. Of course, if you know him, you know his name is Edward Caissie. I have a very rare brain disease that was diagnosed on January 22, 2015. It’s called Hashimoto’s Encephalopathy (Autoimmune) with Progressive Cerebella Ataxia. Basically my own antibodies are attacking my body. The challenge with this diease and Terri’s condition is that it requires a walker, physical therapy, massages to handle the ever-cramping muscles, and much, much more. 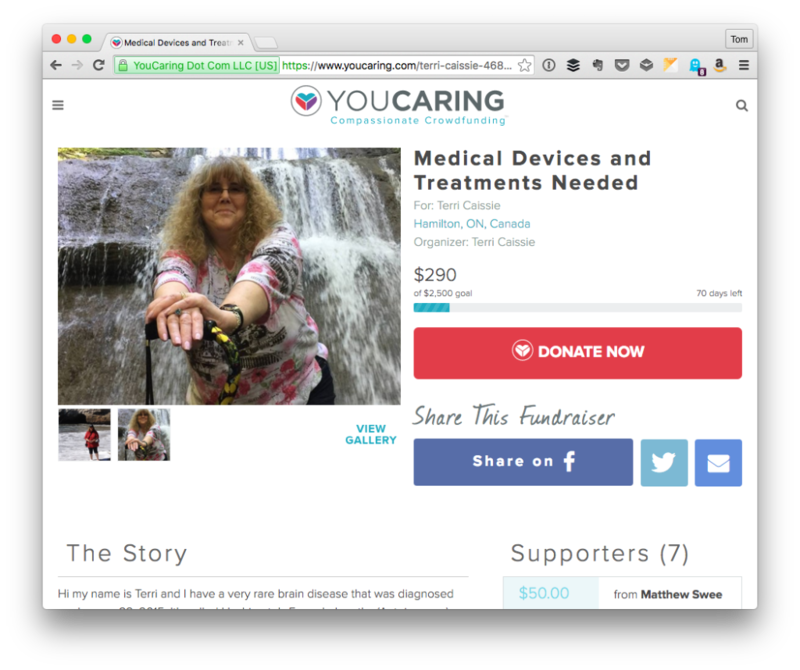 I know Terri would like to get more awareness for Hashimoto’s Encephalopathy … aside from raising monies for these continued expenses, awareness is really her primary goal. The disease is so rare with roughly 2-300 people worldwide being diagnosed. So in aiming to try to help Terri with her condition, we’ll also be helping to bring more awareness to this rare disease. To say that we have potential to make a striking impact for not just one person, but many people, would be an understatement. As with any situation, there’s much more to this and I’m sure Ed would be happy to talk with each of you should you have any questions. But at this point, there should be enough information and links available for you to decide if, how, and/or when you’d like to help. I can’t speak for everyone, but whenever I see someone in need of medical help and I read the challenges that they’re facing, raising awareness and donating money feels like such a small thing to do. …and on and on it goes. To that end, I’m doing what I can for Terri and for Ed now, what I hope to be able to do for others in the future, and what I wish I could do for everyone. So for those of you who are able, please help spread the word. If you can’t make a donation, no big deal! Furthermore, Terri has also offered that, if you’d like something in return, you can order a print or a canvas from her collection in return from your donation. The point is, I’ve seen the people involved with WordPress – and the online community at large – raise an amazing amount of money for various causes. So regardless of what you’re able to do and how you’re able to help, let’s try to push this further than where it sits today. It’ll help both Terri and others who have suffered or are suffering from this disease. And that’s a large impact we’d all be able to make.